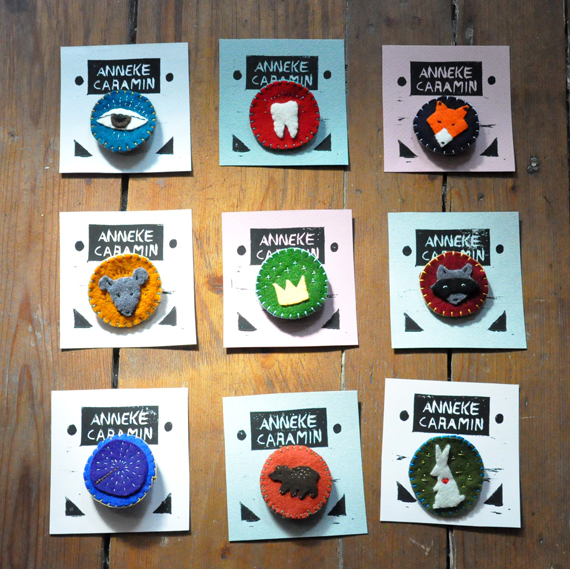 Anneke Caramin: If only I could wear 200 brooches at once. If only I could wear 200 brooches at once. A few months ago, two good friends told me and my boyfriend they wanted to start their own business. They wanted to open a store in the middle of Antwerp to sell pretty things and unique souvenirs, and asked me and a couple of other people to make products for them. I went for postcards, limited lino prints, printed tote bags and felt brooches, and today I'll show you one of these things! 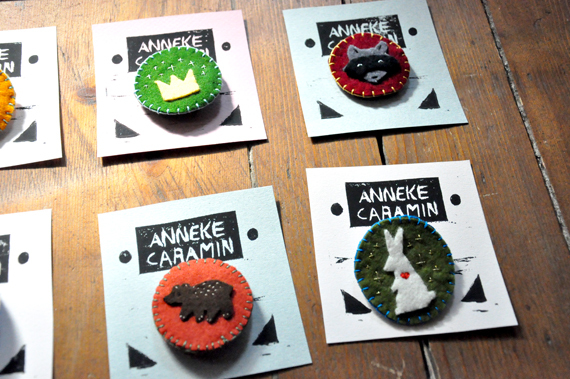 I have been making these little brooches for a while now, but never seriously thought about selling them (more in an 'ok if you want it I'll make it' kind of way). Over the past few weeks I spent a few days watching the X-Files and embroidering. With nice results! 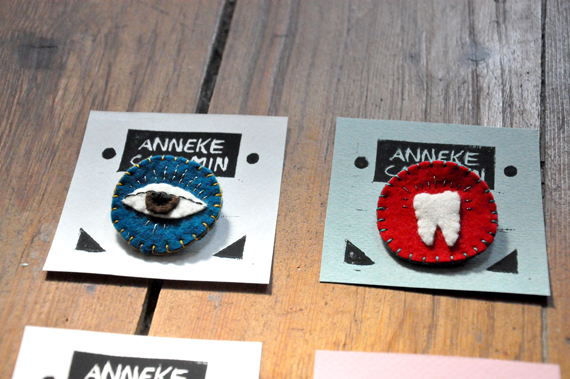 Every brooch is made from 100% wool felt, and entirely handcut and sewn. I first sketch the brooch on sturdy paper, cut it out, use the general shape to cut out the background and then cut the smaller shapes out of that to cut the details. This means that each one is unique! I had to find a way to present them that would look decent but not be too expensive or hard to do. In the end I carved a stamp on some mounted softcut (which I only used because I was going to stamp it by hand, it's horrible stuff that feels like cutting chewing gum and I'd much rather cut real lino and use a press or spoon!) and went to town on sturdy coloured paper. The result looks 'legit' according to the boyfriend! I have some pictures of the linoprinting process lined up as well, but those will have to wait for after my holiday. See you in about three weeks! PS: If anyone in New York, Portland, Seattle or Vancouver wants to meet up, don't forget to let me know!